Hi everyone! The scariest season of the year is upon us and we’re celebrating with two weeks of sales on ghastly games and movies. Whether you’re escaping a haunted asylum, surviving a zombie apocalypse, or fighting your way out of hell, save up to 75 percent with PlayStation Store’s Sale of the Dead. PlayStation Plus members save up to 85 percent. Starting right now, pick up titles like Deadlight: Director’s Cut, Outlast, and The Walking Dead: The Complete First Season, as well as films like the This Is The End, Evil Dead (2013) and more – all for wicked good prices. Check out the full lineup here, but don’t wait too long to trick or treat yourself. 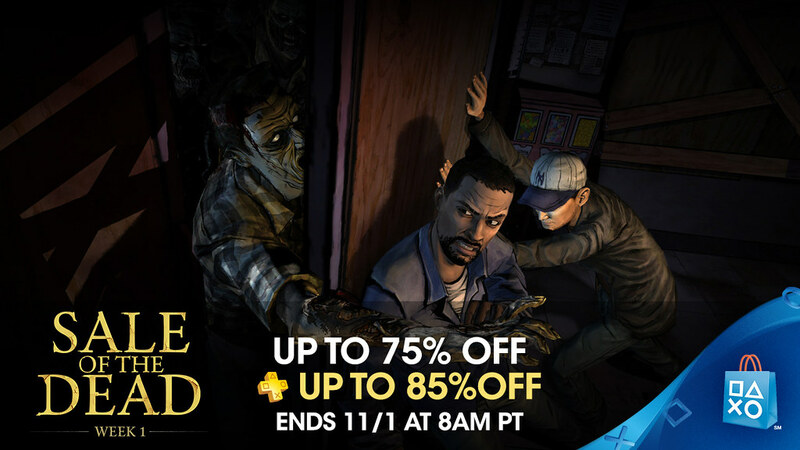 Week 1 of PS Store’s Sale of the Dead ends October 31, 8 a.m. PST. Don’t forget to check back Tuesday, November 1 for Sale of the Dead Week 2 and a brand new lineup of terrifying titles. Does nobody notice the PS Plus sale price and the NON PS Plus sale price, is in the same table with the regular price !!!!!!!! The price for Neverending Nightmares is still a bit high for a purchase from me. I’m really thinking about getting TWD S1 on PS4 for that price. I played both seasons on Vita, but it appears to me that TellTale has abandoned Vita despite saying “they’re huge fans”. I have S2 on PS4 thanks to PS+, and I’ll need a way to play S3. They have a way to make up for previous choices but haven’t told us too much about it. Lastly, I never played RE4 but was waiting for a sale on the physical version. Although $10 off is still tempting. I wonder what week 2 will bring? (Until Dawn, Bloodborne, Silent Hill, other RE, The Evil Within). theres a week two ??? You guys really need a new systems to display these sales. They are getting difficult to go through. At least highlight the sale and/or PS Plus prices. Evil Within DLC sale, that’s what I was expecting (and Siren 2 as a PS2 classic, but that will never happen). Please… bring back MAG remastered for PS4… I miss that game !!! Omg please no. I sunk so much time into that game. Nice sale. Wish DarkStalkers Chaos Chronicles was on sale for PSP/PS Vita too. I wish capcom would bring Chaos Chronicles to PS3 in HD,its much better than Resurrection. Remember in the past when the best PSN sales of the year were around Halloween? Now we can forget about that. PSN doesn’t even try anymore. Cool story? See that little ‘week 1’ up there? Maybe wait for week 2 before you lose your mind. If you enjoy puzzle games, The Swapper is EASILY worth the $3 asking price (in my opinion, of course). I was waiting for some better games and deals, until dawn please ! Question for anyone who knows… who owns the rights to SOCOM II? Since Zipper is no longer in existence, I’d assume it’s ownership is under the PlayStation banner. That’s a game I’d LOVE to see released on PS4… even the PS2 version of it. If they remaster it properly (not change ANY levels) except for maybe add a tree or some other small items…. it could be amazing. I would kill for MAG on PS4 also. Don’t want to single out any game or developer but based on game length, these prices are still too high….even with a sale. A 1.5 hour game costing nearly $10? A 3-hour game costing nearly $15? Lotta nerve to ask those prices. If a game is less than 2 hours long, it should be $2 or less. Anything else is a rip-off and an insult to gamers. I don’t care if these short games are blessed by the pope himself. Make the prices appropriate for the game’s length. By the way, quality should have nothing to do with prices when it comes to game length. I don’t care if it’s the best game I’ve ever played…..a 1.5 hour game is still a 1.5 hour game and should be priced accordingly. If you really feel comfortable paying big money for just 1.5 hours of enjoyment, we’re probably dealing with a whole different profession. And it ain’t gaming, my friends. Too bad there isn’t a store update. The Evil Within for November’s PS Plus title, and The Old Hunters DLC as a part of the “Sale of the Dead, Week 2” promotion, please? I would be extremely grateful if both were to happen next Tuesday. Hell, I will just settle for one out of two at this point. While I think Evil Within would be a great choice for PS+ next month, I already own it so would rather have Until Dawn free. But for everyone else, that would be great. Decent sale but I already got all the good games there. PS:RE6 $8…RE6 Ultimate Edition $7…lol what gives?…you guys might want to look on that. Anyway…will deposit ma hopes on week 2. Someone knows how many weeks are? Some great titles, most of which I already own. Question though, Dead Rising 1, 2 and DLC at 13.99 each but the triple bundle is still 59.49? That language has GAME OF THRONES – SEASON PASS for PS4? Hi Sir, please I hope Homefront: The Revolution, and Dirt Rally will be on sale soon. thank you so much. Title says “75% off Deadlight”, but it’s only 50% off. I would have actually bought it at 75% off.